I noticed that a beer in the bottle tastes one way and the same beer served to me in a cup elsewhere tastes different. First, I thought the temperature difference would cause the taste difference, but no. I also thought that the cup the beer was served in would change the taste, but no. I tried this a couple of times and couldn't figure out what was causing the taste difference. 1) Temperature absolutely plays a difference in beer taste. 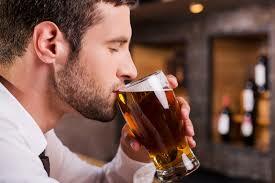 The biggest issue with beer served too cold is the way the temperature masks many flavors and aromas. The cold temperature slows the volatilization of aromatic compounds causing them to linger in the beer. When these compounds are not released, it dramatically changes the apparent flavor and aroma of the beer, sometimes to the point where it may come across as thin and tasteless. (American Homebrewers Association). Warm beer, on the other hand, does allow for more of the flavors and aromas to come to the forefront, but as beer approaches room temperature the sensations from hop bitterness and carbonation can decrease, which can lead to an almost flat-tasting experience. (American Homebrewers Association). So here are suggested temperatures for serving various types of beer. Data from Tasting Beer by Randy Mosher. 3) What type of beer is it? If it is a nano brewery, it could be several things (wild yeast, inconsistency in brewing process, fermentation time, bourbon barrels stored in, etc.). 4) What was your drinking environment the first time/subsequent times you drank? Have you ever eaten somewhere for the first time while starving and with good friends you haven't seen in a while? That food will forever be amazing in your mind. You go back years later with a normal appetite and people you see regularly and the experience can be very different. There's a good chance it's got to do with UV light. The chemical compound in hops that makes them bitter (isohumulones) can produce something called 3-MBT (3-methylbut-2-ene-1-thiol) when sunlight hits it. 3-MBT will make your beer taste skunky. A noticeable change in flavor will start to occur really quickly, within seconds of direct sunlight. If the bottle you had was green or clear, those allow light in, so they're susceptible to this effect. If the cup of beer you had came from a keg....the almighty keg is impervious. Additionally, any beer that you drink outside can be affected. Bitter beers like IPAs will suffer faster and more noticeably because they have more isohumulones. Though, this doesn't happen to all beers. Some of the bigger breweries, like Miller, use a stabilized hop extract that won't produce MBT. The takeaway, if you don't like the skunk, drink beer from dark bottles or cans when outside. And more importantly, if some beer snob irritates you, give them hell for destroying the flavor profile of their expensive beer. Pouring the beer is going to lose some of the carbonation. Also you smell the beer more in a glass. And it enter the mouth differently from a glass. On a hot day cheap beer I like it in can. A nice darker beer I will drink from a (chilled) glass.